Le Craque is unlike traditional crackle mediums, in that it creates much more subtle, natural looking cracks in your painted or embossed finishes. Le Craque Extreme provides a more pronounced, dramatic crackle look for your painted or embossed finishes. Use both versions in conjunction with other Maison Blanche Paint Company products to create a believably authentic, delicately cracked finish. Le Craqueis a clear, water based medium that offers a subtle crackled effect. Applying Le Craque between two layers of Maison Blanche Paint Company’s Furniture Paint will cause the top color to crack and reveal glimpses of the base color. 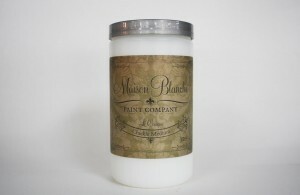 Le Craque can also be used to crack Maison Blanche Paint Company’s Glacage Embossing Crème by applying a coat of Le Craque prior to spreading on Glacage. To Use: Apply a thin layer of La Craque to a piece that has been painted with Maison Blanche Paint Company’s Furniture Paint using a paint brush, foam brush, or foam roller and allow to dry completely. Next, apply another color of our Furniture Paint or Glacage Embossing Crème. Cracks will form in the Paint/Glacage as it dries. Soap and water cleanup.